Explore Melbourne’s spectacular bay views and iconic bayside landmarks aboard our stunning Boom Trike and learn of some of our intriguing maritime history. We begin where Melbourne itself began by touring the Western edge of the Bay near the mouth of the Yarra River - we start by exploring the historic maritime village of Williamstown, located on Hobson’s Bay and Port Phillip Bay. From here you’ll see glorious views of Melbourne across the Bay, and learn of the area’s rich maritime history and its significance in both the development and defence of Melbourne, and its leading roles in our emerging industries of the time. From there we cross back over one of Melbourne’s major bridges to explore the Bay from the Eastern side of the Yarra River and visit historic Station Pier in Port Melbourne, the berthing place of our passenger liners and the ferry to Tasmania. We then travel along the foreshore of Port Phillip Bay to visit the ever popular St Kilda area with all its charms and iconic landmarks including Luna Park, the Palais Theatre, St Kilda Pier and the Esplanade Markets (operating on Sundays only). 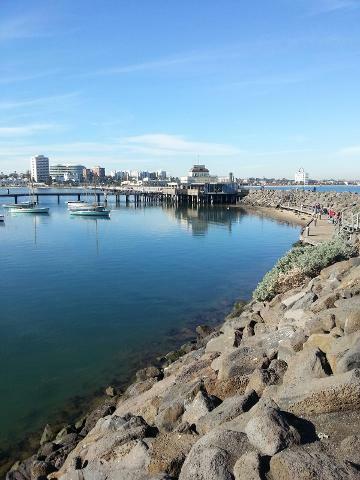 Our ultimate bayside tour gives you the time to walk around and explore these sights, including walking out onto St Kilda Pier to take in some great city views and maybe spot a Little Penguin from the colony in the breakwater. We now move on down the Bay and tour past some of Melbourne’s most expensive bayside real estate, stopping for views from some glorious bay vantage points before visiting those famous Brighton Beach Boxes. Take the opportunity to get your toes in the sand and admire these colourful Melbourne icons. We then visit Black Rock Jetty to put the final pieces of Victoria’s maritime history puzzle together at the breakwater off Half Moon Bay. View the Cerberus wreck and learn a little about our only surviving ship of the Australian colonial navies. We adapt and personalise all of our tours depending on your requirements within the timeframe, so if you prefer less walking we may have time to include a visit to Albert Park Lake and a lap of Melbourne’s Formula 1 Grand Prix track on the way back from Port Phillip Bay. There are multiple stops at various locations for walking around, taking photos and absorbing the vibe of our wonderful city and Bay - or for a coffee or ice cream. There is capacity to vary our stop times and route as it's entirely your choice within the time frame - and we will make suggestions so that you get the most out of your experience.